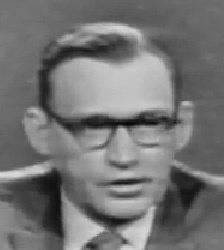 Info Willard Franklin "Bill" Shadel was an ABC News anchor who moderated the third Kennedy-Nixon debate in 1960. Shadel was born on 7/31/1908 in Milton WI. He earned a master's degree in History from the University of Michigan. He became editor of the American Rifleman, which sent him overseas to cover World War II in 1943. Edward R. Murrow, the CBS correspondent, met him in Europe and recruited Shadel to work for CBS radio. Shadel was one of eight CBS reporters (then called the "Gang of Eight") who covered the D-Day invasion for CBS radio. He then covered the Battle of the Bulge and the liberation of the Buchenwalk concentration camp. At the end of World War II, CBS Radio moved Shadel to its Washington DC office. While there, his colleague Walter Cronkite began to anchor a news program for WTOP-TV and brought Shadel to help; he worked for WTOP-TV 10 years. Shadel did not like television at first, saying later that his bald head dominated the screen because he originally spent most of his time reading his script (as he had done for radio). Soon thereafter, a newly minted television producer told Shadel that he wouldn't be taken seriously as a television anchor until he improved his appearance; Shadel immediately purchased a toupee and wore one through the remainder of his career. He was the first host of CBS's "Face the Nation" in the mid- 1950s. ABC News hired Shadel in the late 1950s to replace John Daly, who was retiring from the evening news. At the time, Shadel became one of ABC's three evening anchors who worked on alternate evenings. He spent 12 hours in the anchor chair during John Glenn's initial space flight. In 1960, ABC chose Shadel to serve as moderator for the third Kennedy-Nixon debate, which was taped in Los Angeles. Kennedy's schedule prevented him from being in Los Angeles, and ABC was able to film him in a studio in New York City and have his answers to the questions broadcast in the Los Angeles studio where Shadel and Nixon were. While it was a technological masterpiece of the day's technology, Shadel later said he was disappointed by the debate because he believed the Quemoy and Matsu islands were not as important as Nixon and Kennedy thought. Nixon confronted Shadel after the debate for not enforcing the rule against Kennedy bringing in notes. In 1963, Shadel's health was increasingly poor. He retired from television and became a journalism professor at the University of Washington. He taught for 12 years. Shadel died on 1/29/2005 at age 96 in an assisted living home in Renton WA. Los Angeles Times obituary; Washington Post obituary.